The new edition of The Gull newsletter for Winter 2019 is now available online. Also read about Anna’s Hummingbirds and the Return of Birdathon and the line up of Fundraising Trips for 2019. 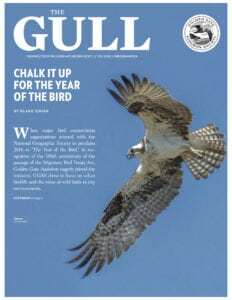 Of course this issue of The Gull also includes upcoming GGAS events and our Speaker Series in January and February. 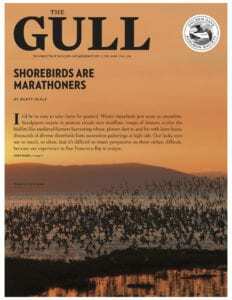 Click here to read it: TheGull_Winter19. The new edition of The Gull newsletter for Fall 2018 is now available online. Also read about the birding abundance of Arrowhead Marsh, wintering Sanderlings, and our line-up of international birding tours for 2018. 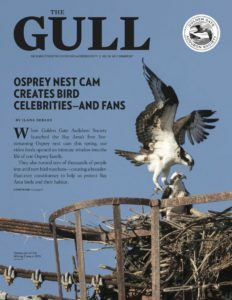 Of course this issue of The Gull also includes upcoming GGAS events like the Christmas Bird Count, and our Speaker Series in October and November. And, the our 2019 photo calendar available for sale. Click here to read it: TheGull_Fall_18. The new edition of The Gull newsletter for Spring/Summer 2018 is now available online. Learn how Golden Gate Audubon Society chalked it up for the Year of the Bird. Get an update on the Black-crowned Night-Heron and egret relocation in Oakland. 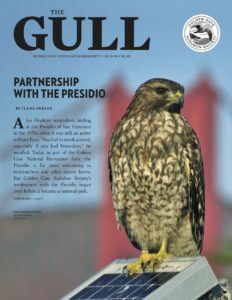 Of course this issue of The Gull also includes upcoming GGAS events like the Burrowing Owl docent training and the calendar for our Speaker Series in July, August, and september. The new edition of The Gull newsletter for Fall 2017 is now available online. Learn about Golden Gate Audubon Society’s longstanding relationship with the Presidio. Also get the latest news on birding at the Presidio, wandering warblers, and our line-up of international birding tours for 2018. 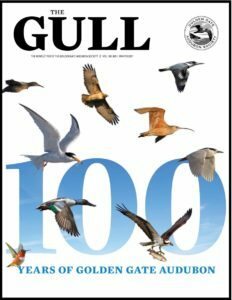 Of course this issue of The Gull also includes upcoming GGAS events like the Christmas Bird Count and the calendar for our Speaker Series in October and November. Click here to read it: TheGull_Fall_17. The new edition of The Gull newsletter for Summer 2017 is now available online. Learn the story behind the Bay Area’s first live Osprey nest cam, which has drawn over 44,000 viewers. Also get the latest news on Oakland herons, the results of Birdathon 2017, and the distinctive California Thrasher. Of course this issue of The Gull also includes upcoming GGAS events and the calendar for our Speaker Series in July, August, and September! Click here to read it: Gull_Summer_17. The new edition of The Gull newsletter for Spring 2017 is now available online. Learn about how we helped secure an upgraded haulout for harbor seals, Brown Pelicans and other water birds in Alameda. Also get the scoop on birding at Vollmer Peak, the secretive Sora, and our Albany shoreline bird survey. 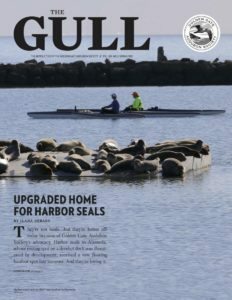 Of course this issue of The Gull also includes GGAS news updates and the calendar for our Speaker Series in April, May, and June! Click here to read it: TheGull_Spring2017. The new edition of The Gull newsletter for Winter 2017 is now available — a special 20-page issue celebrating the Centennial of our founding in 1917! Read it for stories and images from 100 years of protecting Bay Area birds. Learn about our successful campaigns to prevent oil spills, create Audubon Canyon Ranch, and preserve Mono Lake, and meet past GGAS heroes such as Elsie Roemer, Paul Covel, and Junea Kelly. Also get the scoop on our traveling Centennial museum exhibit, which will be on display at five public venues throughout 2017! We hope you’ll celebrate this landmark year with us at the exhibit or at one of our other events throughout the year. Of course this issue of The Gull also includes GGAS news updates and the calendar for our Speaker Series in January, February and March! Click here to read it: TheGull_Winter2017. P.S. 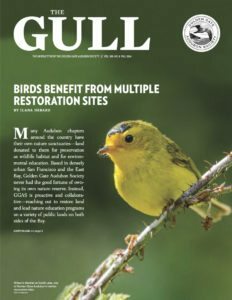 If you’re a GGAS member who gets the Gull online by email but would like a print copy of this special edition, contact our office at ggas@goldengateaudubon.org. We’ll be happy to mail you one. The new edition of The Gull newsletter for Fall 2016 is now available online. Read it to learn to learn about Golden Gate Audubon’s habitat restoration work at seven public sites on both sides of the Bay. 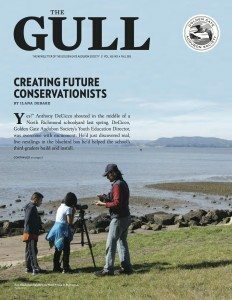 Also get the scoop on raptors in autumn; birding at Crissy Lagoon; protecting harbor seals in Alameda; the dynamic volunteers behind our Travel with GGAS program, and the upcoming 2016 Christmas Bird Count. And of course it includes the calendar for our Speaker Series in October and November too! The new edition of The Gull newsletter for Summer 2016 is now available online. 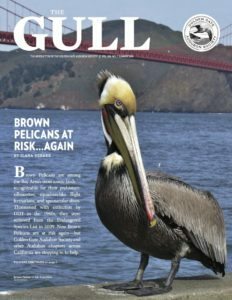 Read it to learn to learn how Golden Gate Audubon is helping to protect Brown Pelicans, which were removed from the endangered species list in 2009 but now face new challenges. 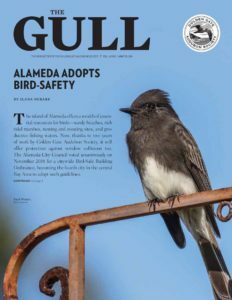 Also get the scoop on Marsh Wrens; our partnership to rescue young herons in downtown Oakland; Bob Lewis receiving the ABA’s Chandler Robbins Award; and our Birdathon 2016 prize winners. And of course it includes the calendar for our Speaker Series in July, August, and September! The new edition of The Gull newsletter for Spring 2016 is now available online. Read it to learn to learn why Golden Gate Audubon supports Measure AA, the parcel tax to restore San Francisco Bay wetlands that will be on the June ballot. Also get the scoop on birding at Mitchell Canyon; Red-breasted Nuthatches; and our 2016 Birdathon. And of course it includes the calendar for our Speaker Series in April, May, and June! 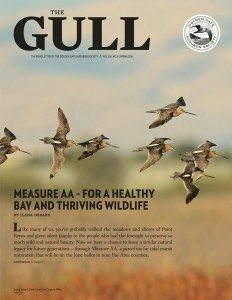 The new edition of The Gull newsletter for Winter 2016 is now available online. Read it to learn to learn how Golden Gate Audubon is working to prevent bird-building collisions in the Bay Area. Also get the scoop on birding at Glen Canyon Park; Cedar Waxwings; and the GGAS Board of Directors. And of course it includes the calendar for our Speaker Series in January, February, and March! The new edition of The Gull newsletter for Fall 2015 is now available online. 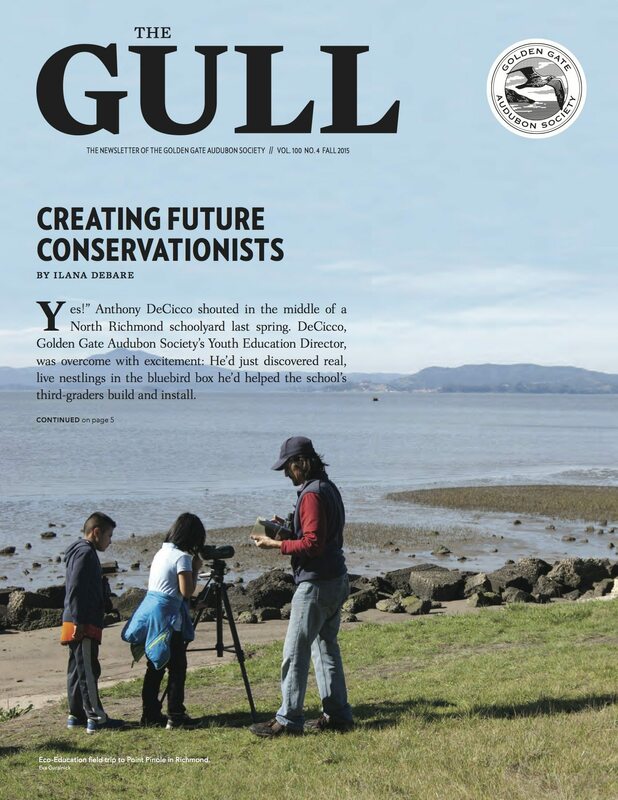 Read it to learn about how Golden Gate Audubon is fostering the next generation of conservationists through our Eco-Education program. 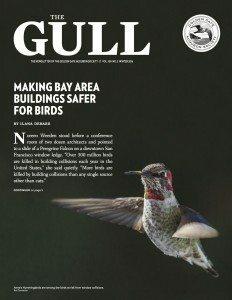 Also get the scoop on birding at Coyote Hills; the annual fly-in of Vaux’s Swifts at McNear Brickyard in San Rafael; and our work on bird-safe buildings and wildlife protection in the Golden Gate National Recreation Area. And of course it includes the calendar for our Speaker Series in October and November, as well as info on our 2015 Christmas Bird Count.